We’re camped in Southern Oregon tasting wine but today the story is about food. A few minutes north of Ashland on a quiet, semi-rural highway sparsely populated with lower middle class homes stands one of the most acclaimed restaurants you probably have never heard of—New Sammy’s Cowboy Bistro. The building looks like it could be a restaurant although the vegetable gardens surrounding the property suggest a cook on the premises. At any rate, this small, low-key restaurant has been featured in many magazine lists of worthy foodie destinations and has been lauded by critics all over the country. It’s been operated by Vernon and Charlene Rollins since 1989. Long story short, Vernon and Charlene met at Alice Waters’ Chez Panisse in 1978. Charlene was a cook and Vernon imported French wine. Shortly after marrying, they opened a restaurant in the boonies in a place called Booneville, two hours north of San Francisco, with the help of lots of high powered investors. For awhile due to their exquisite attention to detail and love of home-grown fresh ingredients, it was one of the hottest restaurants in the country, but they proceeded to run it into the ground due to bad management. It’s rumored that they hi-tailed it out of town in a borrowed car leaving investors and employees holding the bag. 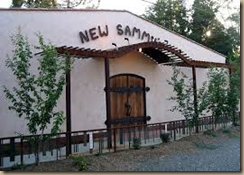 At any rate, after a year in France, they resurfaced in Talent, Oregon opening New Sammy’s Cowboy Bistro, named after their son Sammy and their desire to feed the cowboys living in the neighborhood. They use the best organic, local ingredients, much of it grown on premises and the wine list was reported to be one of the best in the country a few years ago before they started selling it off. Even today the list is full of impressive wines from France, Italy and Spain at bargain prices. Premier Crus Burgundy for under $70 in a restaurant is unheard of these days but there were several on the menu. The dining room is spacious but has only about 10 tables. The price of lunch is only $15 dollars. The menu included only 4 items one of which was unavailable. But the cooking is exquisite. Perfect ingredients prepared with the utmost attention to detail. A stew of various vegetables, black beans and polenta was so well balanced it felt weightless in the mouth. Despite the sheer number of ingredients each component was distinct and perfectly cooked. The burger made from grass fed beef topped with bacon, goat cheese, spinach and alioli was bursting with flavor. This is the quintessential mom and pop business, purely dedicated to quality. Alas the Rollin’s are well into their 70’s and announced their intention to sell the business late last year. So if you’re in this part of the country, check out this icon before it’s too late. Cross posted on Edible Arts on 6/22/2017.